← Can Memoir Compete with Fiction? Is there any feeling quite as pleasant as being a few pages into a book and realizing you’ve got a great one in your hands? The tactile message from your right hand reminding you there are lots of pages ahead is as delightful as sitting down to a banquet after glimpsing the bounty lined up in the kitchen. 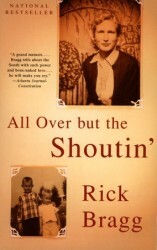 For years I’ve heard about Rick Bragg and his books, All Over but the Shoutin’ and Ava’s Man, from my colleagues in memoir reading and writing. I had a void in my library request list recently–meaning the New York Times hadn’t reviewed any memoirs that appealed to me–and I decided it was time to catch up on overlooked classics. I’ve just finished All Over but the Shoutin‘. This book goes on the shelf in the section on southern life, with its evocations of scenes like Dinner on the Ground at the Hollis Crossroads Baptists Church circa 1962, its memories of a little boy in hand-me-down shoes riding the cotton sack behind his momma as she picked because there was no one home to leave the baby with. This could easily fit on the shelf with the “awful childhood memoirs” next to The Glass Castle or The Liar’s Club. But its most compelling storyline–Rick’s desire to give his mother a reward on Earth that she only expects to find in Heaven–fills it with a haunting pairing of emotional generosity and self-reproach. That sentence gets at why I find memoir as a genre so compelling, and why I found Bragg’s writing so enjoyable. He ties a generous sense of humor to a gentle self-deprecating way of riding the story as its protagonist but never its hero. I just put a library hold on Ava’s Man, his 2002 book about his mother’s family. If there’s anything as pleasant as being a few pages into a book and realizing you’ve got a great one, it’s knowing that another book by the same author is on its way. His language and accent draw me and hold me in the same way Tommy Lee Jones draws me to any movie he’s in. Heck of a storyteller, too! can someone tell me all the people in the book?? ?